One of the major benefit of using Hibernate in large application is it’s support for caching, hence reducing database queries and better performance. Caching is all about application performance optimization and it sits between your application and the database to avoid the number of database hits as many as possible to give a better performance for performance critical applications. Second level cache is disabled by default in hibernate, so we would need to enable it and add some configurations to get it working. Our hibernate.cfg.xml file looks like below. hibernate.cache.region.factory_class is used to define the Factory class for Second level caching, I am using org.hibernate.cache.ehcache.EhCacheRegionFactory for this. If you want the factory class to be singleton, you should use org.hibernate.cache.ehcache.SingletonEhCacheRegionFactory class. If you are using Hibernate 3, corresponding classes will be net.sf.ehcache.hibernate.EhCacheRegionFactory and net.sf.ehcache.hibernate.SingletonEhCacheRegionFactory. 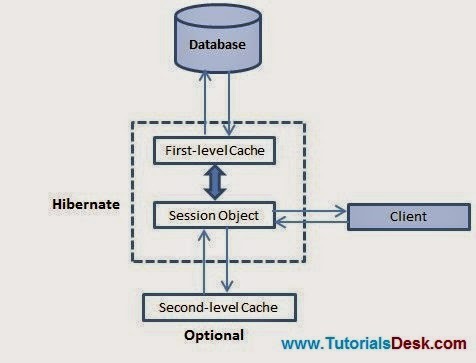 hibernate.cache.use_second_level_cache is used to enable the second level cache. hibernate.cache.use_query_cache is used to enable the query cache, without it HQL queries results will not be cached. net.sf.ehcache.configurationResourceName is used to define the EHCache configuration file location, it’s an optional parameter and if it’s not present EHCache will try to locate ehcache.xml file in the application classpath. That's it, now we have second-level caching enabled for the Employee class and Hibernate now hits the second-level cache whenever you navigate to a Employee or when you load a Employee by identifier. You should analyze your all the classes and choose appropriate caching strategy for each of the classes. Sometime, second-level caching may downgrade the performance of the application. So it is recommended to benchmark your application first without enabling caching and later on enable your well suited caching and check the performance. If caching is not improving system performance then there is no point in enabling any type of caching. In Hibernate Annotation, we use @Cache to set table level cache. We also need to set @Cacheable. The class CacheConcurrencyStrategy of the package org.hibernate.annotations, provides the caching. In Hibernate Collections to cache the collection at column level @Cache is used and CacheConcurrencyStrategy class provides the caching. We need to set it at property level in our entity. Hope we are able to explain you Caching in Hibernate, if you have any questions or suggestions please write to us using contact us form. (Second Menu from top left).